According to many studies, it is difficult for immigrants to get jobs that match their education and qualifications, and their skills are not properly utilized at Finnish workplaces. On the other hand, the skills of immigrants might be quite different from the skills required by employers. Whose skills are not utilized, and what kinds of needs for developing skills do multicultural workplaces have? This publication suggests solutions to these problems, among others. 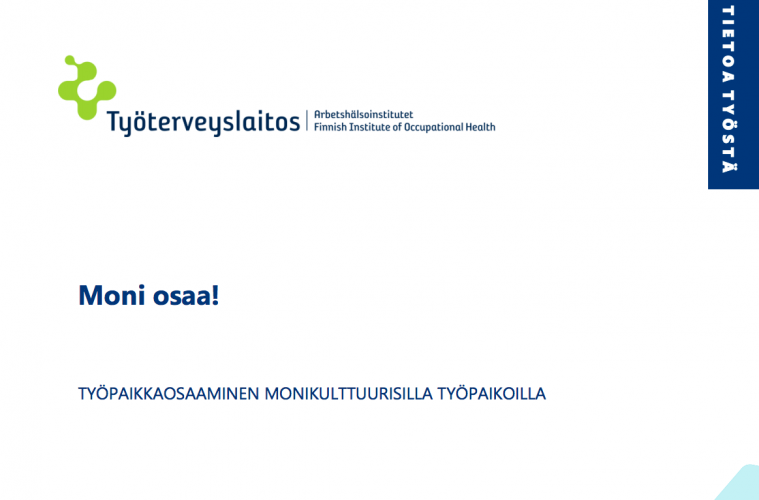 The publication is based on the Osaamisen ja työn yhteensopivuus monikulttuuristuvilla työpaikoilla (Compatibility of Competence and Work at the Multicultural Workplace) study, funded by the Finnish Work Environment Fund and the Finnish Institute of Occupational Health (2015–2018). The study is based on both quantitative and qualitative material. The key material used was interviews with employees from immigrant backgrounds (N = 33) and with supervisors and key personnel (N = 31), conducted in two multicultural food industry companies, Diversity barometer 2016 (N = 255) and Survey on work and well-being among people of foreign origin (UTH survey) (N = approx. 3,000). In addition, the project included seven workshops arranged at the target companies. The over-education of immigrants and its relationship to their well-being were assessed in the study, based on the population-wide UTH material. According to our study, people who are over-educated for their job were clearly over-represented among immigrants, compared to other sections of the population. The situation was especially challenging for immigrants with an African background, of which more than half were over-educated for their current job. Over-educated people regarded their quality of life lower than people who had a job corresponding to their level of education. In addition, discrimination at workplaces was significantly more widespread among over-educated people than among people who had a job corresponding to their level of education. The project helped develop a deeper understanding of the skills of employees with immigrant backgrounds and their development based on extensive material gained in interviews and workshops. The material indicated that multicultural workplaces require, in addition to professional competence, so-called workplace skills that are based on common understanding and language. The workplace skills consist of a shared understanding of work processes and the work as a whole, understanding workplace roles and ways of participating, knowledge of the rules at the workplace and in Finnish work life, cultural and social skills and skills in occupational health and safety. These dimensions of workplace skills are those that were discovered to be troublesome and difficult at workplaces and which were not yet on a level of truly shared understanding. The development of workplace skills is highlighted in multicultural work communities because of different levels of language skills and cultural backgrounds. Many interviewed immigrants felt that they had the necessary qualifications and the desire to move on to more challenging tasks. On the other hand, supervisors and the HR management personnel felt that it was difficult to begin training for those whose skills required support the most. There were also those at workplaces who did not have strong language skills and whose skills were limited to a few simple tasks, but were not particularly interested in gaining wider competence or developing their language skills. The challenges presented by language skills made moving on to new tasks and gaining a more extensive job description difficult because language skills had an effect on both understanding instructions and gaining a wider overall picture. From a managerial perspective, looking after the skills and development of employees in weaker positions was also deemed to be important. Many immigrants who participated in the study felt that the low hierarchy and relatively open dialogue at Finnish workplaces was strange as things were done differently in their countries of origin. Although most immigrants were hard-working employees, a significant number of them had assumed the role of a passive listener. Due to different cultural backgrounds, weak language skills or established workplace methods, immigrants were not always courageous enough to ask questions in problem situations, report mistakes or present development suggestions. Employees with an immigrant background may require more than the normal amount of reassurance and encouragement to participate. The interview material also indicated that some employees with immigrant backgrounds had a different attitude towards, for example, working time, absence policies, interaction or the manner of speaking between supervisors and subordinates. The rules of Finnish work life, such as overtime regulations, were not necessarily familiar to all. Multicultural workplaces should place emphasis on discussing the procedures and practices of Finnish work culture— for example, during induction training. The culture of the country of origin often influences the employee’s perception of appropriate conduct at a workplace, even implicitly. The different backgrounds of employees and misunderstandings caused by the lack of a common strong language sometimes caused conflicts at the workplaces that participated in the study. Respect towards diversity and commonly adopted rules of interaction and co-operation were essential for the functionality of the work community. Finding a balance between taking special needs into consideration and equal treatment at the workplace is also vital. Instructions related to occupational health and safety can be difficult to understand in a multicultural workplace if the process of learning the language is not completed. Your own rights in a foreign culture might be difficult to understand— for example, some employees might not have the courage to take sick leave. However, it is important that all employees know how to perform their job safely and work towards improving safety in the workplace. Illustrations and simple language can help improve the level of understanding at multicultural workplaces. The Diversity barometer conducted within the project studied HR professionals’ views about the skills of employees with immigrant backgrounds and the needs for developing these skills. According to them, the most significant development areas for employees with immigrant backgrounds were Finnish and Swedish language skills. Other development areas included an understanding of the wider context of their line of work, formal education, skills gained in previous work experience and familiarity with social networks. However, the HR professionals also assessed that ethnic diversity can make the workplace’s competence more extensive by, for example, introducing new ideas and perspectives and improve customer service. Based on these findings, the Multiskills! A model for developing workplace skills in multicultural workplaces practical model was developed during the project. The model offers support for analyzing, recognizing and developing the skills of employees with immigrant backgrounds at workplaces. It provides a tool for strengthening workplace skills by increasing interaction between supervisors and employees. Next ArticleDO YOU WANT TO FOUND AN ASSOCIATION?